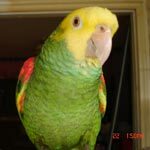 Parrot Forum • View topic - Hello! Frankie’sMommy wrote: No no, he doesn’t eat all day. I have him out of his cage all day. btw just to go on a towel. I am not that dumb. No one accused you of being dumb. We just get so excited when a new "birdy baby" is added to our flock. We love our birds. We know each other's birds and love them too. You should never supplement birds with Omega 6, it would create an imbalance and make the bird sick because every grain and seed has omega 6 [pellets are made of seeds and grains] and the thing with omegas is that they need to be in perfect balance or it's worse than giving them nothing [Dr. Harrison -the same Harrison of the pellets- noted in his last avian medicine book that people were getting their birds sick by giving them omega supplements]. As Omega 3 goes, adding flax seed to their soft food is all they need. More is not better with birds. Hello Darlene and Sheldon, welcome to the forum! I also have a 4 year old quaker but it's a female [her name is Keku and I ADORE her! ], is Sheldon DNA'd a male?